There is no doubt that technology has become an integral part of the retail and restaurant environment. The spaces that were once expected to be functional and productive are now required to offer more than just a product or a service—it must provide a unique, lasting and memorable experience. This is especially true in retail, where the physical store is only one element of an entire brand experience. In many cases, the store is the physical brand experience, and the “dot com” is where the actual transaction may take place. The growing need for an enhanced customer experience has created a dramatic surge in digital integration initiatives. Today, brands are trying to determine how to integrate technology into their physical spaces. To accomplish this goal, brands are integrating various solutions ranging from digital signage and menu boards to mobile apps, interactive kiosks, beacons and wireless power. The growing need for an enhanced customer experience has created a dramatic surge in digital integration initiatives that are rolling out on a chain-wide basis in stores and restaurants across the country. For many brands, these initiatives require an integrated approach—often involving marketing, store planning/merchandising, construction, IT and other departments to plan for and support a single initiative. But, the biggest challenge is frequently in the deployment of these technologies at each location. While digital signage and other technology upgrades have become more popular than ever, the ability to execute these initiatives remains somewhat fragmented and becomes difficult to organize and coordinate all of the elements of specialized resources and vendors—when what you really need is turnkey solution. When selecting a partner for a digital signage/menu board rollout or other technology program, the most important qualifier is a turnkey experience. And, when it comes to experience, quality and results are just as important as quantity of installations. Successful integrations in many locations help to develop best practices. Experience of the partner is key to predicting how well a company is able to develop the most effective rollout plan, as well as identify in advance how to handle unforeseen challenges and adapt to scope changes—while maintaining quality, consistency, timing and budget. When it comes to turnkey solutions, you can expect a seasoned integration team to have established partnerships with important people and businesses in the program cycle—from content providers, hardware manufacturers, other equipment and millwork providers. The best integration resource will be able to manage the program and work as a liaison between the brand and the many providers for the program. This expertise includes identification of resources, sourcing, scheduling, logistics/consolidation, verification that technology is working at each location and many other procedural requirements. For retail and restaurant brands, closed doors equal lost profits. It is critical to find an integration partner that understands the importance of performing work in an open-store environment. This means professional attire/presentation, respectful and ethical service, and efficient execution. At DAVACO, for example, we utilize our own W-2/T-4 employees to oversee and in most cases execute the onsite work, which allows us to validate the caliber of person who is showing up at the jobsite. Then, our phased approach to execution greatly reduces any disturbance and assures little to no interruption to regular operations, store personnel or customers. For restaurants—who place a high priority on health and cleanliness—finding a resource that can perform work that is scheduled around non-peak hours and/or at night is a necessity—especially when the work is extensive and involves back-of-house or a significant area of the front of house. A turnkey provider should be able to do more than hang a screen. In fact, it’s rare that a rollout would be that simple. Finding a provider that has a broad skill-set that ranges from technical to carpentry is preferred. From minor interior updates and full-scale remodels to site preparation, electrical and content/connectivity verification, retail and restaurant brands need a team with the proficiency to make change happen at each location. In retail, digital initiatives are usually a corporate-led program being executed in corporate-owned locations. However, from a restaurant perspective—QSR, in particular—these rollouts not only have to be presented and sold to franchisees, but also coordinated and funded through those owner/operators. This level of service complicates the process and is often challenging for digital integrators, many of which do not have the infrastructure to support the communication and processes requirements. The best provider will be able to accommodate the franchisee’s individual needs as well as achieve corporate’s overall program objectives, by offering an in-house franchisee expert and a dedicated team to help facilitate the management and execution of the program with all the vested players. Using technology to complement the management and execution of the digital rollout allows for greater efficiency and visibility throughout the rollout. DAVACO’s ClearThread® is an example of a mobile app that enables the real-time transfer of store/restaurant data to a centralized, secure client website for robust program reporting. Finding a turnkey solution that can provide value-added services, like technology-based reporting, will further ease the process of rolling out a major initiative across the chain. Finding a resource that has a strong, nationwide presence lends itself to the breadth and expertise needed to install and maintain a fleet of digital screens. The average lifespan of a digital screen is between four to seven years depending on usage and other factors. Given this expectancy, it’s a good assumption that a retail or restaurant brand will need to retrofit an existing design or rollout a technology upgrade as part of an anticipated and budgeted maintenance plan. Establishing long-term partnerships with your integration team brings greater credibility and reliability of technology performing correctly at each location for future programs. DAVACO is a member of the Digital Signage Federation, the only independent, not-for-profit trade organization serving the digital signage industry. The DSF supports and promotes the common business interests of worldwide digital signage, interactive technologies and digital out-of-home network industries. To learn more, go to www.digitalsignagefederation.org. 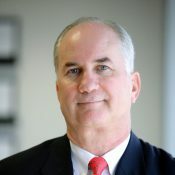 Rick Davis currently serves as the chief executive officer of DAVACO, where he is responsible for the overall management and strategic development of the company. He founded the company in 1990 to provide high-volume program management and execution for the retail, restaurant and hospitality industries.